We‘re an independent clothing shop specialising in period vintage and Vintage-style clothes From 40s through to the 90s we have attire for all tastes and occasions you might be revamping your whole wardrobe or just need an outfit for a party/event: either way we have something for you. Out with the new...in with the vintage. We‘re here to refresh your wardrobes and bring new life to old clothing. 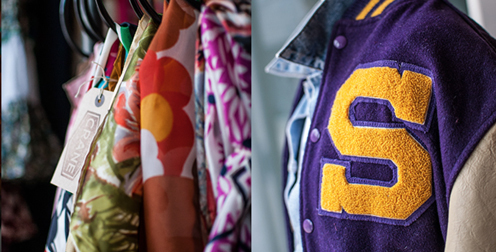 We‘ve got everything you need to release your inner vintage psyche. For the ladies we have party dresses. maxi dresses. boho dresses, skirts. cardigans and scarves as well as accessories including handbags. sunglasses and jewellery. We often have pieces by Aquascutum. Pucci, Ossie Clark as well as pieces by Carnegie, Lady Vintage and Voodoo Vixen. For gentlemen you won‘t have to stand outside playing with your smartphone as we have Levi jeans, leathers jackets. waistcoats, tweed jackets and Hawaiian shirts. So the question we are always asked is why are we called Crane Vintage? Firstly, no it is not the founder‘s surname and secondly, no the name wasn‘t born out of the oriental belief that the Crane bird symbolises longevity and thus we are. in our own small way. increasing the longevity of the clothes we sell by giving them a new life. The simple answer is that owner Carole bought the sign in our shop 12 months before we even had a slightest inkling that we would open a shop. When pondering names for our new business, we thought we would repurpose the sign and thought it would make a good name for a shop and as a result Crane Vintage was born. 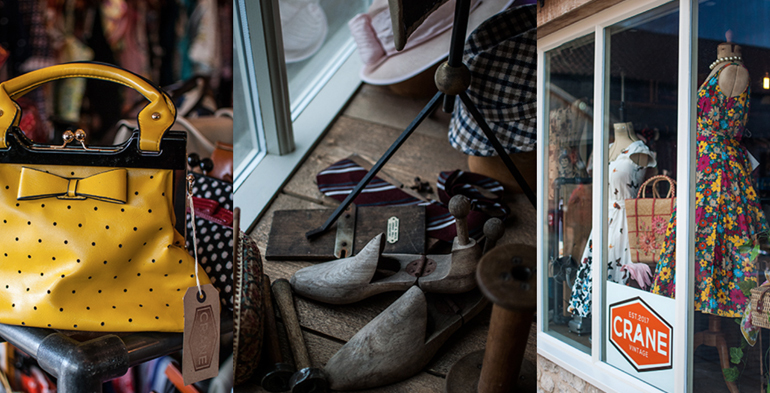 We are open seven days a week, but we also offer a private shopping experience out of hours for busy folks.